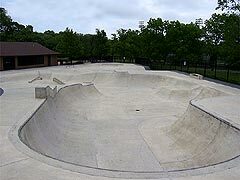 The Waukegan Skate Park is located in Bowen Park at 1815 N. Sheridan Road. CAUTION: Inline skating and skateboarding are high-risk recreational activities with inherent risks of serious injury. Skating with others around is recommended in case of injury. Parent(s)/guardian(s) are responsible for supervising their children. It is recommended that proper protective equipment such as helmets, elbow pads, knee pads, etc. be used during skating activities. It is the responsibility of the skater to ensure that skateboards, in-line skates and equipment are in good working condition. Personally owned ramps, boxes or other devices may NOT be brought into the facility. Inspect the premises before use to make sure it is safe and remove debris that could interfere with the safe use of this facility. Do not use equipment if broken and contact the Parks Department at 847-360-4725. Bikes and motorized equipment are NOT allowed. Persons not skating are prohibited from using the skating structures. Graffiti, tagging, littering or defacing of Park District property is prohibited and may result in the closure of the facility. Glass objects and containers are not allowed in the skating area. Skate Park Hours: When front gate is open until sunset. Be courteous to other skaters and park users. 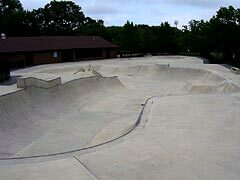 This is your skate park. Protect it from vandalism. Help to preserve it. Be considerate of our neighbors. Keep noise to a minimum. We welcome your ideas to make this skate park the best it can be. “An Ordinance Regulating the Use of the Parks And Property Owned or Controlled by the Waukegan Park District” applies.